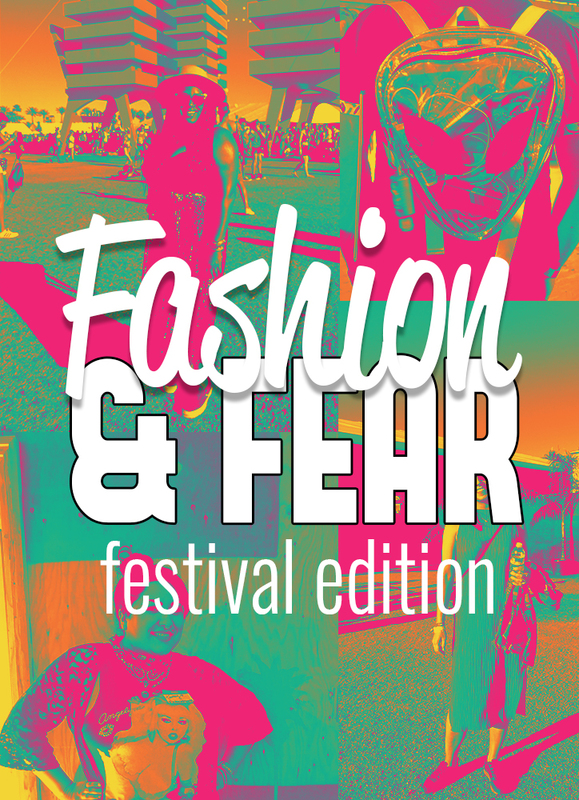 I cringe at the words Festival Fashion. It’s cheesy and tired. Not that I don’t love bohemian inspired looks, give me some fringe and a Fleetwood Mac* album and I’m a happy lady. But the fast fashion regurgitation of desert and free spirit styles is boring to me. 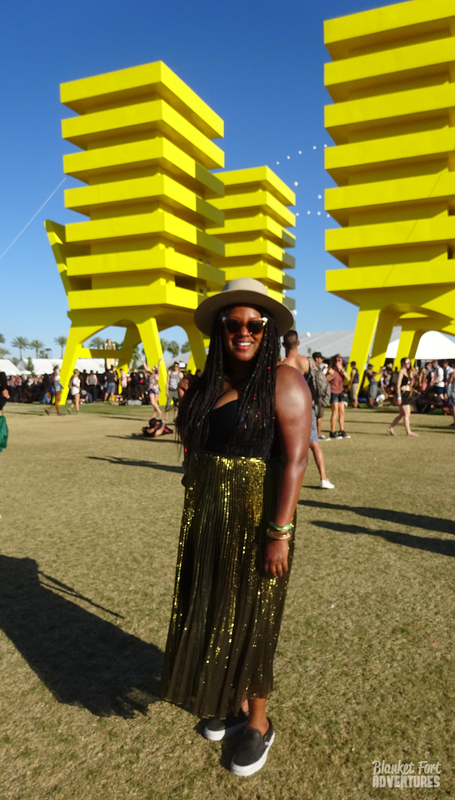 After weekend 1 of Coachella where I spotted some seriously awesome #ootd from a few select people, I decided I would challenge myself to document my favorite festival styles on Weekend 2. Festival fashion that is unique and fresh, that expresses individuality without the blatant “hey look at me” written across their chest – I’m looking at you red Power Ranger. Sadly, on Day 1 of Coachella Weekend 2 I didn’t rise to my festival fashion challenge. I let fear and stress stand in my way. So on Day 2, I really tried to motivate myself. I let a few outfits pass me by before I had a serious talk with the fear stricken part of my brain and said, “what if every time you let someone amazing pass you by you were setting $100 on fire?” Or better yet, “what if every time you took a photo you made $100?” With my new mind trick, I set the goal of making a metaphorical grand over the next few days. I grabbed my zombie* point and shoot camera from the record store office and kept it in my pocket. Waiting for well-dressed festival goers to walk into the record store until I could really go on a hunt during my break. And know what I discovered!? When you start searching for unique style that stands out in a crowd of people, it’s REALLY HARD to find those people. 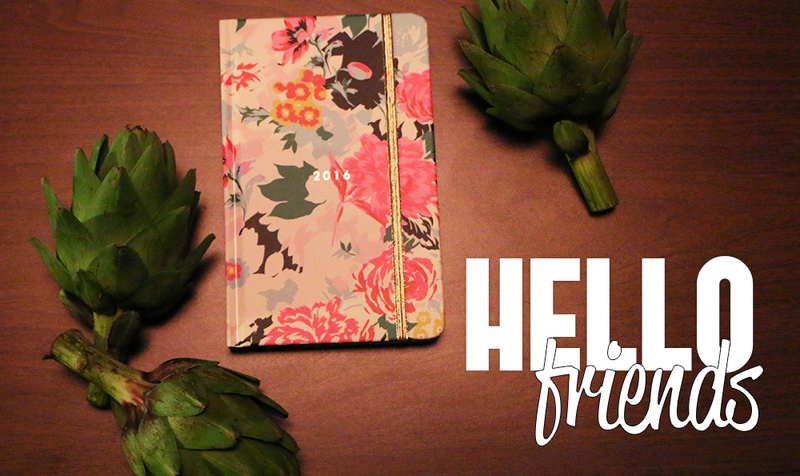 Especially with my standards – I’m not a fashion blogger but I do have an aversion to conformity. Aside from one tall man with amazing black and white layered style who I let my fear stop me from snapping; I only found two people on my break! By my next break, the sun was down and so was my window of opportunity. I had no luck on Day 3 and realized I will leave the fashion reporting to the fashion bloggers. My eye is a little too demanding and unsatisfied by repetition. I think that’s why I’ve never been a huge fan of Warhol art, I don’t LOVE repetition although I can respect the art of quantity, I am just one for quality. Here are the people who inspired me with their festival fashion! 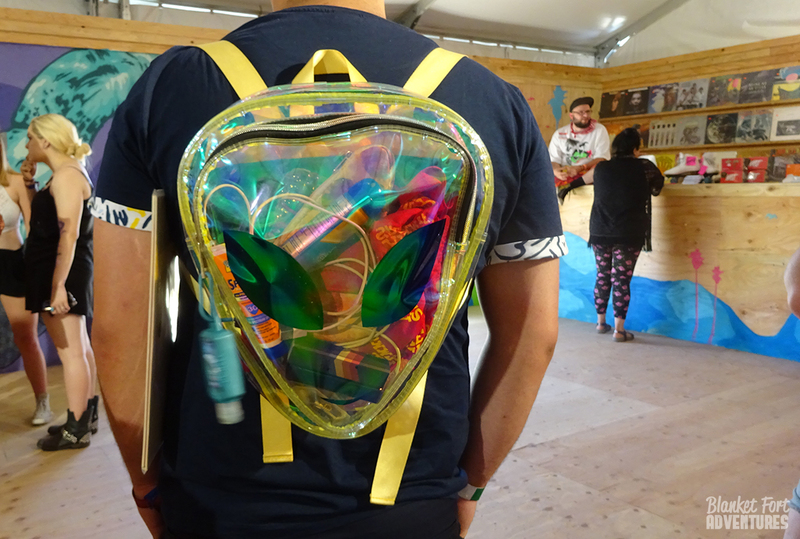 I thought this see-through alien backpack was awesome! Perfect for all the festival must-haves like sunscreen and portable phone charger, plus it exudes a sense of fun that a musical festival should have. This fab #ootd is from Tawny (@ladamademente), one of my record store co-workers. I was obsessed with her Angelyne t-shirt and how she styled her look. Angelyne is a cult icon in Los Angeles. If you’re not familiar with Angelyne, imagine a John Waters character in real life – I wouldn’t be surprised if the two of them were best friends or at least have been at the same after-hours party. Anyways, I loved how Tawny paired the shirt with floral leggings and a lacey fringe cover up. The outfit had just the right amount of edge, camp, and totally feminine – plus it was comfortable from her head down to her toes. I spotted this stylish festival goer (@jomillie) while watching Run The Jewels and I literally ran after her. Her gold skirt shimmering in the sun and the way she styled her outfit was on point. As I snapped her picture I noticed she had rainbow glittering thread throughout her braids – beautiful! She looked cool and unique amongst a sea of earth tones. Apparently I have a thing for pleats and outfits that flow. 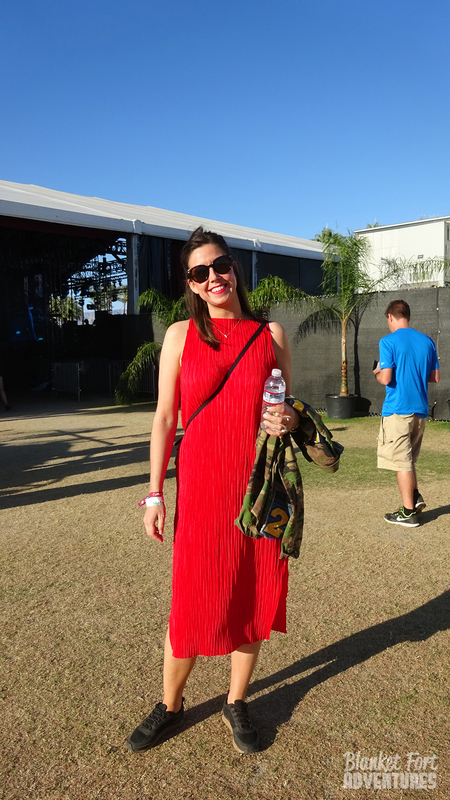 The last fashionable festival goer was this stylish lady in red while headed to Bat fo Lashes. She was exiting the tent and I loved her effortless cool-girl style. A comfortable bold pleated dress with a high neckline and black sneakers. I also noticed the army jacket in her arms that I knew when the sun went down would only amplify her look. Her minimalist but far from boring style was finished with a simple necklace, delicate cross-body, and stylish sunnies. She rocked an outfit I wish I owned. I hope you enjoyed my first street style post. If you liked it and think I should push through my fear more often and document the styles that excite me, leave me an encouraging comment below. I do love my gold stars. *Fleetwood Mac – The record store had misplaced a box of Fleetwood Mac Rumor albums that had been set aside for Weekend 2 of Coachella. I was the bounty hunter that found the treasured vinyl and by Saturday afternoon, the people had their Rumors. *Zombie Camera – A week before we went to Coachella my broken point and shoot camera I usually use for vlogging came back to life. Yay for zombie camera but I need to invest in a new point and shoot. *Oh yeah I worked at the Coachella Record Store and that is why I have been M.I.A for the last month. I came across the Jelly Bean “The Time You Have” video this morning and rewatched it. It was originally published in 2013. At that time I was at a toxic job, with no savings in my bank account for a grand adventure I wanted to take, my foot was half-way in multiple side projects, and the only thing that sparkled was the fact I had met the man of my dreams. I watched this video and it hit me like a ton of bricks (as I’m sure it does a lot of people) and made me re-evaluate my life. I started to leave the office on my lunch breaks and read out in the courtyard. I fully committed to the book I was writing with my sister (that is finished and being pitched to agents). Nine months after this video was published, I started saving for my cross-country road trip, changing how I treated money to make that dream happen. The video changed me. But now as I rewatch it I noticed something I didn’t see before. As the narrator breaks down the days of our lives into eating, chores, community responsibilities, and grooming; I don’t view that time as wasted but now see it as opportunities for discovery. Walking the dog isn’t wasted time, but the chance to connect with your partner or enjoy fresh air. Community responsibilities like attending church are those peaceful reflective moments one gets to have for themselves, check in with their spiritual self and feel rooted to carry on through rough storms. Showering is my everyday spa experience; I add a few essential oils to the shower steam and massage my head during the rinse and repeat process. Somedays eating is just quick and purely fuel, but other days it’s an exciting opportunity to try a new restaurant, recipe, or enjoy my favorite comfort food. All those jelly beans made into cute pictures before the giant question mark box are portrayed as wasted time or days, time that is reserved only for those activities. But what the video fails to illuminate is that during those times you are still able to connect and discover. You are still able to live life the way you want! When Marie Forleo was on Super Soul Sunday she told Oprah how she believes life isn’t about following one passion, but putting passion into everything. Make your bed with passion, cook breakfast with passion, write a letter with passion, put love into everything you do and you will live a passionate life. Instead of seeing wasted jelly beans with only a small fraction left for yourself, realize all of your other jelly beans are also for yourself. You can color and flavor your jelly beans any way you desire. Even the commuting jelly beans, which are the WORST jelly beans are still an opportunity for something fun or new to discover. 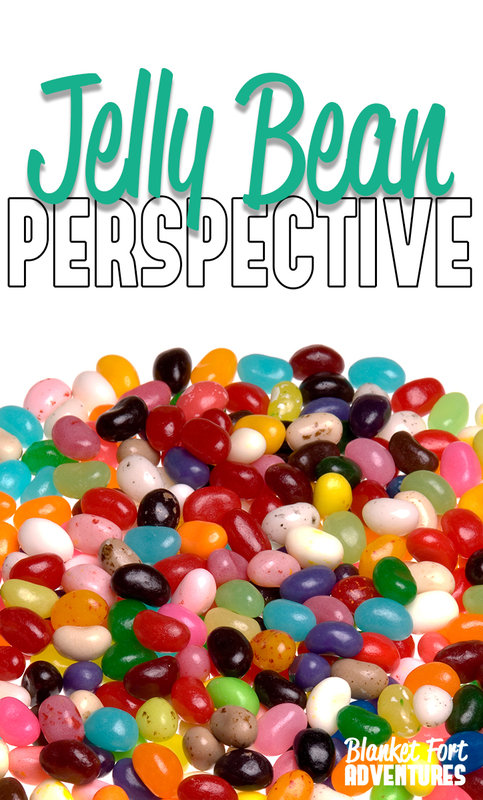 You just have to decide how you want that jelly bean to be. I believe paying attention to the little things during all those activities will help to add more sparkle to the moment. I’d love for you to discover my “Little Things” series and get you to start noticing the little thing in your life more!